Sagging skin appears with the passing of the years. Linked to ageing, it is above all due to change in the skin’s connective tissues, which get thinner as elastic and collagen fibres decline and dwindle, the blood flow slows down, and hydration decreases. Factors such as sun exposure, hormonal changes, pregnancy and diets are all responsible for this phenomenon. Resorbing suspension threads are one technique to lift slack skin. Currently, tensile threads are the only light technique which gives an immediate lift by restoring the body’s contours. 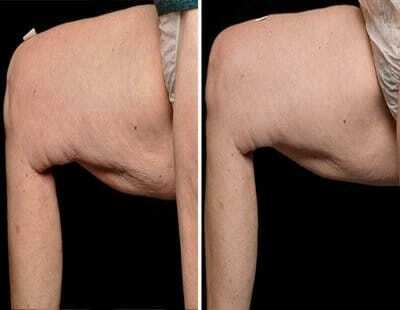 Radiofrequency is a medical alternative to body lifts. An electrical current penetrates the skin, and heats it deeply, without overheating the epidermis, thus without burning or causing pain. The higher temperature stimulates the production of new collagen fibres, and makes them denser, leading to deep dermal remodelling, and softer, firmer skin. The results are gradual, as one must wait for new collagen fibres to be produced. Improvement takes several months. ( see the section on Radiofrequency ). The area to be treated is delimited and an effective number of passages are made. Laser light is transformed into heat when absorbed by the skin. This heat stimulates collagen production, leading to the skin tautening, and thus appearing firmer. The laser must be adapted to a very long shoot time. (See the relevant sections on fractional lasers and laser photo rejuvenation. This technique encourages a growth in the thickness of the dermis by stimulating fibroblasts ( skin cells ) to make new collagen fibres; it also leads to better microcirculation and improved skin elasticity, appearance and ton. After a weight loss, I was looking to tighten my skin. Doctor Romano did sessions of radio frequencies and mesotherapy. I quickly appreciated its efficiency. Enchanted with the result. My skin is much more tonic. Thank you Doctor Romano. With age, my skin sagged. I did 8 radio frequency sessions with Doctor Romano. At last, a doctor that provides results. After 3 pregnancies, my skin was distended. The sessions with Doctor Romano gave me firmness. Laser 150€-200€ each session, it needs 8 sessions. Carboxytherapy 60€ each session (par area), it needs 10 sessions.